I’ve always wondered what the inner workings of a commercial greenhouse might be like, haven’t you? I personally love to know where my food comes from, how it’s grown, and who the people are that grow it. In this day and age it seems like children (and just people in general) have a disconnect when it comes to knowing where their food comes from and what it actually takes to bring those delicious fruits, veggies, and meats to your table. Many people just focus on buying what seems “healthy” without even getting to know the grower or the farmer behind the food. This month, we had the chance to tour the Bushel Boy Farms™ greenhouse facility in Owatonna, Minnesota. Since it’s only a few short hours from my home, I was excited to visit a local commercial grower and to see just how they produce their tasty tomatoes. As my luck would have it, I wound up not feeling well on the day of the tour so my lucky husband got to go in my place, I’m a bit jealous that he got to experience the greenhouse instead of me but I made sure that he took plenty of notes during his tour so that together we can share all about the inside of Bushel Boy Farms with you. 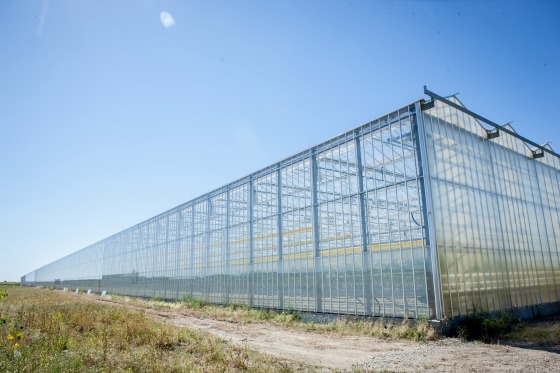 Most of us have been inside a retail greenhouse before, but of course, they are nothing like a commercial, productive greenhouse where things are actually grown. Let us paint you a picture. Walk into the greenhouses and you might be overwhelmed at the size of the buildings (24 acres of buildings in fact…can you imagine? ), and the size of the plants! It’s like a tomato lover’s paradise with the tomato vines growing up to 30 feet long. 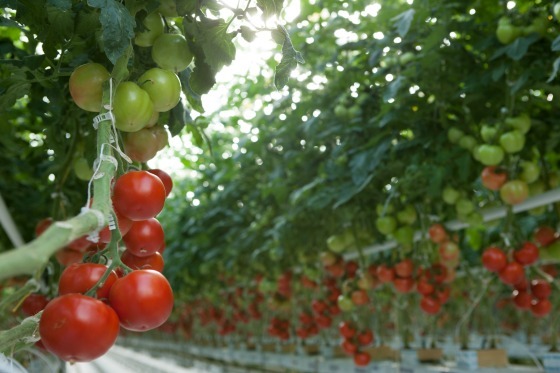 Did you know that tomatoes are actually a vine? Give them enough love and care (and the perfect temps and conditions consistently) and they can reach enormous lengths. You might notice the tracks going down the middle of my picture above. Those tracks are used for many different things within the greenhouse. First of all, they are used as an easier way to transport the carts that are used for picking the tomatoes. They are also used for scissor lifts to take care of the tomatoes since they grow so tall. Finally one of the most ingenius uses of the tracks is that they actually are water pipes to heat the greenhouse during the cold winter months. 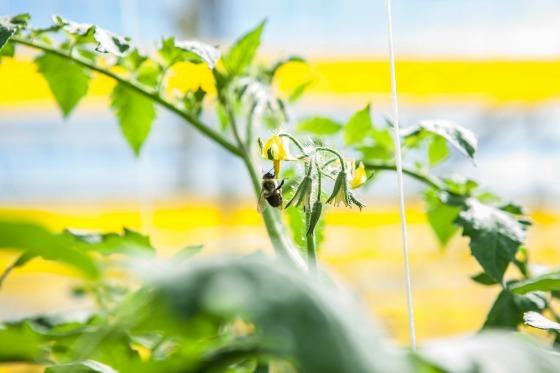 Bushel Boy Farms uses Bumblebees to do all of their pollinating naturally. We loved hearing about how the bees are cared for in their closed environment. Colored markers are used to show to bees back to their hives and at night the bees are carefully “tucked in” by covering their hives so that they will rest and thus let the tomato plants have a bit of a rest. Other insects are also used in the greenhouse as the defense for pest control. 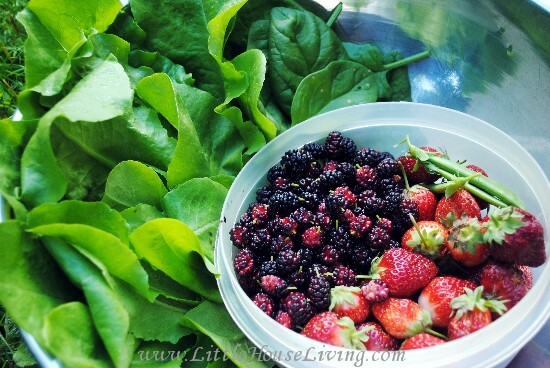 “Good” bugs and larvae are brought in to help to keep the plants healthy and to remove the “bad” bugs from the plants. All of the water in the greenhouse is repurposed. After watering the plants, excess water is collected back through a gutter system and recyled. They also use a boiler to produce steam which helps to heat and it produces cardon dioxide for the plants to eat and to even out the amount of oxygen in the greenhouses. 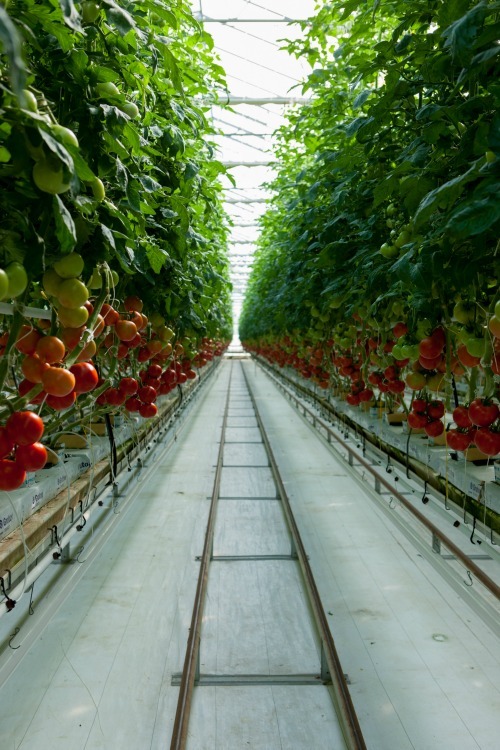 As you can imagine, all of those tomato plants produce quite a bit of oxygen! Thanks to these recycling processes, the greenhouse actually uses 10 to 20 times less water than you and I would use to grow tomatoes out in the garden. All of the old tomato plants are repurposed too. Once they have finished producing they are turned into healthy compost to feed the still growing plants. We’ve had the chance to enjoy Bushel Boy tomatoes for the past week and I have to say that we are quite addicted. 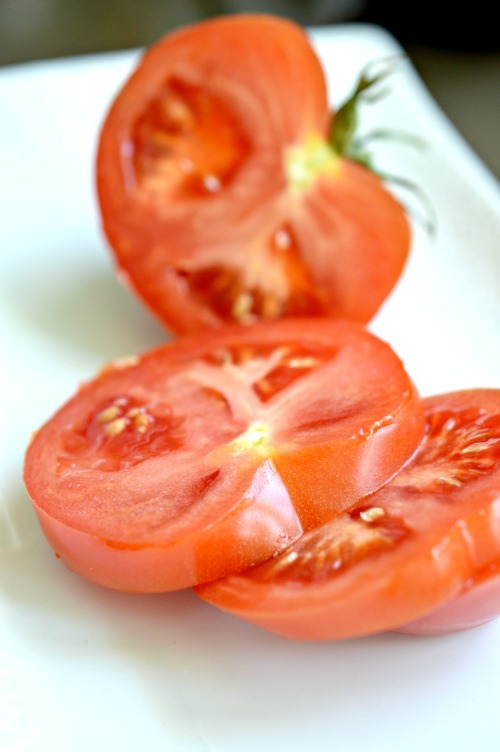 Unlike most tomatoes that you purchase from the grocery store, Bushel Boy tomatoes actually have that delicious, tangy garden taste since they are grown on and ripened right on the vine. I stopped in one of our local Hy-Vee stores the other day and spotted Bushel Boy Farms tomatoes being sold there so now we have a local place to get them! Bushel Boy Farms tomatoes are sold in many large Midwestern locations including Minneapolis/St Paul, Sioux Falls, Omaha, Milwaukee, Des Moines, and more. (You can find the full list of stores here.) Bushel Boy Farms was started in 1990 to be able to provide a location to grow fresh tomatoes all year around…in Minnesota! I’m glad that they do and now I have a new producer to buy tomatoes from in the winter now that I’ve gotten to know all about this greenhouse. Bushel Boy Farms would love to give a little something special to us! One Little House Living reader will win a Wusthof Gourmet 5-1/2-Inch Tomato Knife. To enter to win, simply fill out the Rafflecopter form below. Good luck! I like them in spaghetti salad, and cucumber salad. Loved this about the Bushel Boy Farms, keep up the good work, making the world a better place, going back to Mother Earth! so neat to learn about a commercial green house. Sounds great for us, the bees and the environment. I guess they found the bees would roam at night so the need for tucking in? Not sure I want to tuck in bees but I would eat the tomatoes! Yes, they said that the bees would continue to work through the night if they don’t tuck them in so by doing that, everyone, including the tomato plants, get a little rest.